Presenting… a gratuitous outfit post! In fact, this blog has no substance whatsoever, it is vanity, pure and simple. I usually like to bury my outfit photos in some kind of other subject matter, but I have nothing interesting to say today! I went to visit my parents to discuss my plans for the future, and my week ahead, including what to ask the HR people regarding my redundancy. I have a horrible feeling that I am stuck in my office for another two months at least, which fills me with dread as I shall be both totally unmotivated and itching to move on. Sigh! Anyway, my lovely Dad was imposed upon to take some pictures of my outfit, using my camera. And here they are! This one has lovely latticework on the pockets and neckline. These earrings match the dress so perfectly! it was nothing short of miraculous! My shoes are Briarcliff wedges from Remix. They are a reproduction of a 1940s playshoe, and are so incredibly comfortable. that they look like orthopaedic shoes. Not by me though! Now for a hair closeup! 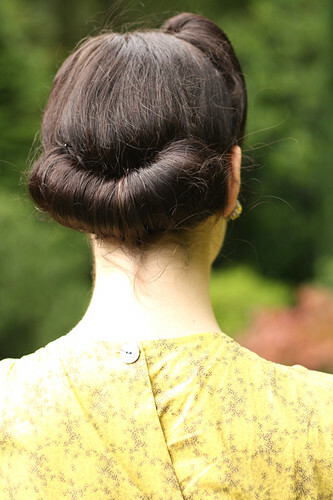 Victory rolls on top and rolled up at the back. The lipstick is MAC Viva Glam I. And because people often ask me what the back looks like… ta-daaa! It was rather windy, so ignore the flyaway bits! I used the same rat that I use for my faux bangs to create this back roll. And that’s that! Here endeth the gratuitous outfit post, I leave you with one final shot, during which the wind obliged me with a bit of extra oomph to show off the skirt of my Swirl! Hope everyone had a good weekend. See you all next week! Fleur, this dress is just beautiful and you've accessorised it… well, perfectly. And your hair… Oh, your hair! Innit! Talk about the biggest demotivator! I have to do 30 days compulsory consultation, and only after that does my month notice start. I shall be insisting on lots of days off for 'interviews' if they won't let me take my money and go. To. Die. I am so happy to see the back of your hair! I never would have guessed it looked like that from the back. So lovely. And the earrings are perfection. Beautiful photos, Dad does fabulous work, love the detail shots of your dress and jewelry! After my redundancy was approved I had to wait 3 loooong weeks before I left. If you have any outstanding sick leave or family leave left I suggest it might be a good idea to use it up before you leave (do you feel a bit of a fever coming on?). Wonderful photos! You look beautiful and you accessorized the whole outfit so well. That would be awful if you were forced to stay in your job for two more months- I only had to stay a week, but it was the slowest week ever where it was near impossible for me to accomplish anything as I was simply counting the minutes to get out of there… I hope your meeting goes well and you do not have to suffer that fate! Your dad is a fantastic photographer and you look beautiful. That latticework on that Swirl dress is amazing. I have a Swirl, too, and it's a completely different style. I didn't know that much about the brand until I read about it on your blog, but it was really cool to learn about something I have in my closet already. I hope you don't have to stay for two months at your job… how annoying that would be! You look beautiful!! And I'm so sorry about you losing your job, but hey, thats what silver linings are for 🙂 And, I am an event manager, so if you need any help about anything, please just flick me an email/comment. I'm more than happy to help! Goodluck with all these future plans, I can't wait to see what you'll do. 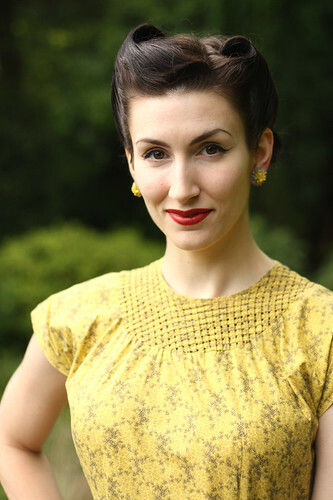 I would love to see a hair tutorial about Victory rolls. I've looked for them on YouTube but haven't really found anything that great yet… Also what type of foundation and makeup do you use? Curious as I am a makeup artist. Your makeup always looks great. Cute outfit. The yellow looks fabulous on you. Cheers! And good luck with the job search! Beautiful! love the dress. don't know why but i never seem to find anything vintage in mustard. Do you use a rat in the back ? Lemondrop Marie: He's good isn't he? He's always been a dabbler in photography. This is with my camera and I set it up but he did some sterling framing! Laurakitty: Thanks so much. Fingers crossed – I find out today! Catherine_sr: He did a good job and no mistake! PLP: Oooh, thank you! I will definitely do that at some point – it's all a bit daunting, but I do think I would be good at it. How did you get into it? I will email you to ask this properly in case you don't see this! Sarah: Thank you, now if only the summer would come back and banish my goosepimples! NW: I will definitely be doing a roll tutorial, it's the next one on my list after the faux bangs, which is the actual next one. I use mineral foundation, though I do use MAC liquid foundation for 'proper' shoots – this was just my regular Lily Lolo Porcelain, everyday one. I use MAC lipsticks, eyeshadow and mascara, but Rimmel brand eyeliner and eyebrow pencil. And Bourjois blusher! Bunny: Aw, thanks so much! I shall head over right now. I'll answer the banner question there so you see it! Oops, posted without refreshing last 3! Betty: Thanks doll, I never have before either, but I think I like it! Kitty: That's so great to hear, one does worry about being overly matchy, tho I don't think I have, yet! MissM: Thank you, and indeed I did, best couple of quid I ever spent (though I do need a new rat, maybe a black one, as it doesn't match my hair any more. oh my god, you are so pretty and so vintage! hot! 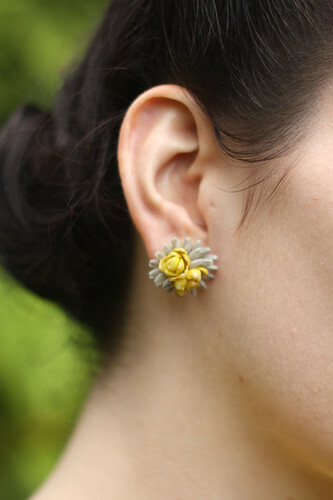 The earring are a perfectly sweet match. Oh all your swirl dresses make me jealous, I'm determined to acquire one! Hello! You're beautiful and your blog is very interesting. No matter what you say about vanity, I can tell your posting is very honest and spontaneous. Come and visit my blog to collect your Award, I wouldn't mind if u choose to don't post about it. Yes I also try to build some textual substance around outfits but sometimes you just have t leave it to what it is – a beautiful dress 🙂 Love it, great colour! Another gorgeous outfit, and positive outlook on a nasty situation. Well done Fleur, you are certainly inspiring! I take it the kitty had not eaten your rat then!? May I ask where you buy such a thing? I'm with everyone on this- cool pics, cool outfit, your dad rocks as a photographer and I shall add the garden setting is just divine! You look absolutely wonderful. I am so envious of you thinner girls who can actually find vintage dresses that fit. That colour is so typical of the time and looks perfect on you. Perfect hair, perfect outfit! Lovely! Ohhhhhhhhh!!!! so lovely and beutifull photos!!!!!!! you look great, your dress SO pretty, your shoes, your make up, your hair, the background and your camera! I mean those photos have a great quality, WOW and more WOW!!!! Me encantaron tus fotos, tu pelo, todo todo esta hermoso!! me encataria tomarme unas fotos asi! beautiful! By the way, you don't have any noticeable flyaways. Not even and ounce of frizz! You are lucky! I live in a very humid climate, so there's no way to avoid the frizz and flyaways! I love this dress it's so simple and so pretty I love the entire look. I looooove the back of your hair. You look altogether stunning.